WEDOWEE--Randolph County voters have spoken: there will be a new hospital. The yes voters overwhelmingly approved a one-percent sales tax for a new hospital, 4,775 votes or 85.99 percent to 778 or 14 percent. The yes votes soundly defeated the no votes in every box including the Roanoke box at the National Guard Armory where 918 voted yes and 380 voted no. It was thought the competition between Wedowee and Roanoke would sink the vote in the armory but as in other boxes voters soundly approved the tax. Bill Caypless, Randolph Healthcare Authority chairman, who has worked tirelessly to educate people on this issue, said they will immediately tackle getting an architect and financing. He would like to see four or five architects to help keep the costs down as they offer options and competitive prices. He does not think that has to be put out for bids but the contractor will have to be bid. Volunteers who worked hard on the election, those who wanted a hospital, and Tanner Health System officials were celebrating across from the courthouse in Wedowee before the boxes were even turned in. They had gone to each voting box location and gotten the numbers that were posted. Jonathan Greg worked with Hearts for Hospital and told the filled room: "We won." Looking to the future he said the power created in this struggle should be harnessed to work on other issues like economic development and other community needs. 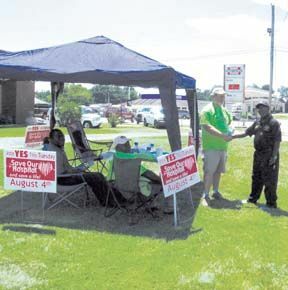 "We want to thank all voters for turning out and showing overwhelming support for continued healthcare in Randolph County, not thinking Roanoke-Wedowee anymore--thinking Randolph County," Caypless said. Caypless said six different corporations have expressed interest in working with them on the financing. They will have to be rated by rating agencies like Standard and Poor's. He is going to talk to all six entities and ask for quotes. A land survey still has to be done for Tanner to deed the authority the land where Tanner Health System Clinic is now on U.S. Highway 431, outside Wedowee. The hospital will be built nearby. Once they get the architect plans they can send them to the contractor to see how much they need to borrow. Circuit clerk/absentee ballot manager Chris May said of the 199 absentee ballots 189 were for the hospital and ten voted against the sales tax. The last special election had 2,600 voters while 4,787 voted in this election. Probate Judge George Diamond said they had the votes counted an hour and ten minutes after the polls closed, which is a record. There were five provisional votes which will be counted in seven days. One man said at his polling place more than double the usual voters turned out with almost all voting for the hospital. Many of them were elderly and concerned about the hospital continuing to exist. Graham voted yes 108 to 7; Morrison Crossroad Fire Department voted 126 yes to 13 no; Corinth voted 99 yes to 17 no; Cavers Grove voted 154 yes to 16 no; Swagg voted 172 yes to 17 no; Woodland Fire Department voted 351 yes to 13 no; Moores Store voted 167 yes to 18 no; Bethel voted 90 yes to 12 no; Wehadkee voted 39 yes to four no; Tin Shop Fire Department voted 264 yes to 31 no. Omaha voted 101 yes to two no; Wedowee City Hall voted 878 yes and 33 no; New Hope voted 105 yes to two no; Midway voted 225 yes to 18 no; Ophelia voted 58 yes and 16 no; Wadley voted 137 yes to 32 no; Level Road voted 152 yes to 42 no; National Guard Armory voted 918 yes to 380 no; Rock Mills voted 91 yes to 33 no; Wilson Store voted 64 yes to 8 no; Bacon Level voted yes 86 and 38 no; Wesley Chapel voted 60 yes and 7 no; Pine Hill voted 141 yes and nine no.